Designing, developing and deploying the perfect application demands an experienced and cohesive team of programmers. Chetu boasts a deep talent pool of industry-specific technology experts, ready to provide you with the custom application development services you require. We develop scalable, enterprise-class Mobile Apps for iOS and Android that take full advantage of native features. For our cross-platform and hybrid apps, we leverage tools like Xamarin, Ionic, and Adobe PhoneGap that help us ensure a consistent functionality and look across platforms. Web-based apps need to perform consistently well across all browsers in order to achieve widespread success. That's why we prioritize clean, organized back ends and dynamic, scalable front ends when developing web portals, enterprise automation apps, microsites, and e-commerce solutions. The future of cloud-based apps (and the internet in general) is run on web services: Software-as-a-Service (SaaS), Platform-as-a-Service (PaaS), and Infrastructure-as-a-Service (IaaS). We require our cloud development team to be experts in these architectures, as well as web protocols like SOAP, REST, and XHTML. We boast a deep talent pool of in industry-specific technology specialists from a wide range of verticals, including retail, healthcare, hospitality, real estate, telecommunications and banking. 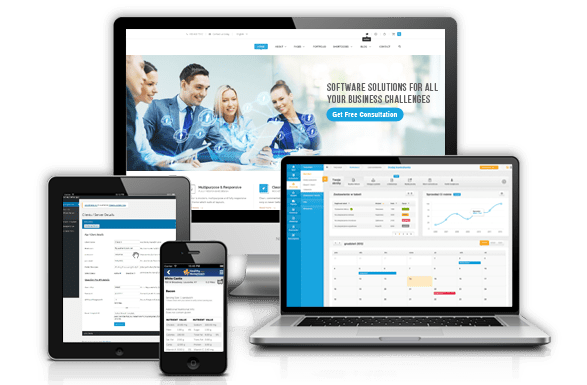 Our apps help automate workflows involving Enterprise Resource Planning (ERP), Customer Relationship Management (CRM) and Supply Chain Management (SCM).